Description: Ailanthus altissima, commonly known as tree-of-heaven (or tree from hell), looks very exotic and is very invasive. 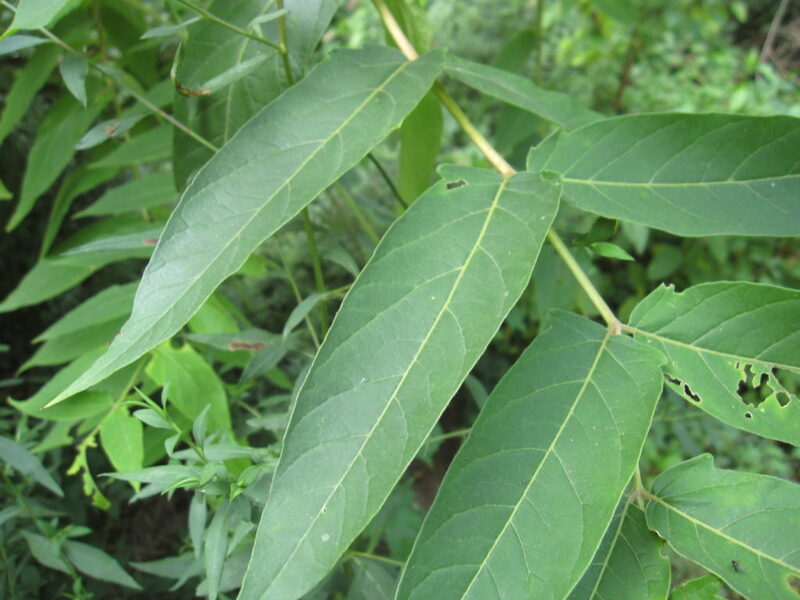 It is often confused with our native sumacs and black walnut. The trunk of tree-of-heaven is smooth (no ridges) and blotchy — resembling pig skin. However, the outstanding difference from other trees is the single “tooth” at the base on the otherwise smooth margin of the leaflets. Black walnut bark is deeply ridged and the leaflets of both black walnuts and sumac trees have serrated edges. The tree-of-heaven is dioecious — meaning trees are either male or female. Annually, the females can produce 300,000 or more wind dispersed seeds, which deposit on open ground and germinate by the hundreds or thousands in large patches for great distances downwind of the mother tree. The female can be recognized by the feathery-looking seed stems that remain at the crown of the tree through the fall, winter, and early spring after the seed pods (samaras) have dropped. The seedlings of tree-of-heaven can be easily pulled out of the ground by hand or with the help of large household or linesman pliers to grip the stem. All parts of the root/rhizome must be removed since anything left in the ground will sprout. Bag and discard. 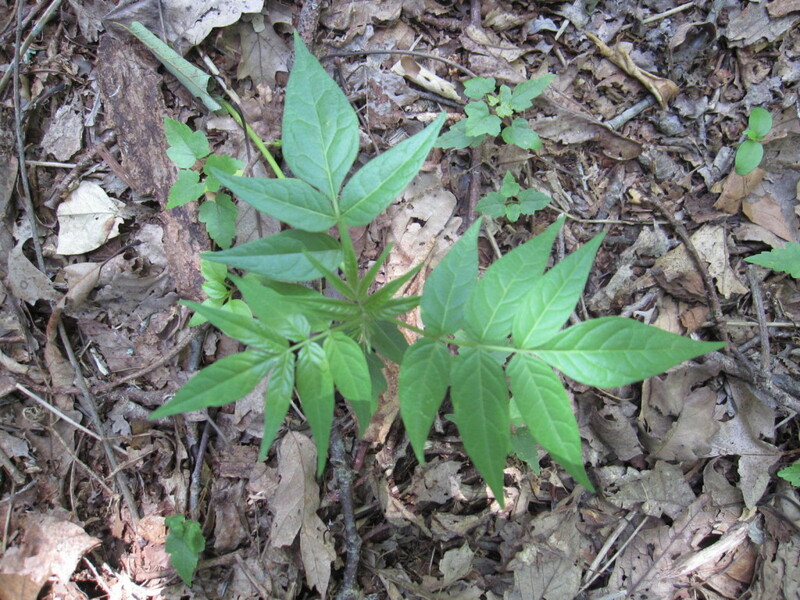 Seedlings grow from seeds deposited by wind disposal and can be recognized by two very round leaves and more mature leaves that begin to resemble the final leaflets. A quick and easy way to clear a large stand of seedlings is to use a squeegee on a pole to draw out and remove the plants with their small roots, or smother with black plastic sheeting for six weeks during mid summer heat. 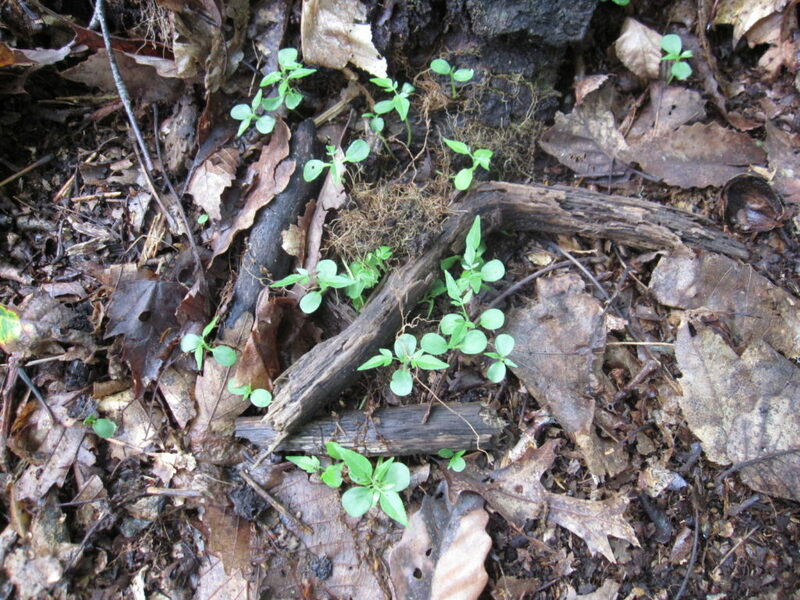 When mixed with leaf mulch, these small seedlings can be composted. Root suckers of tree-of-heaven appear similar to seedlings but with thicker stems. 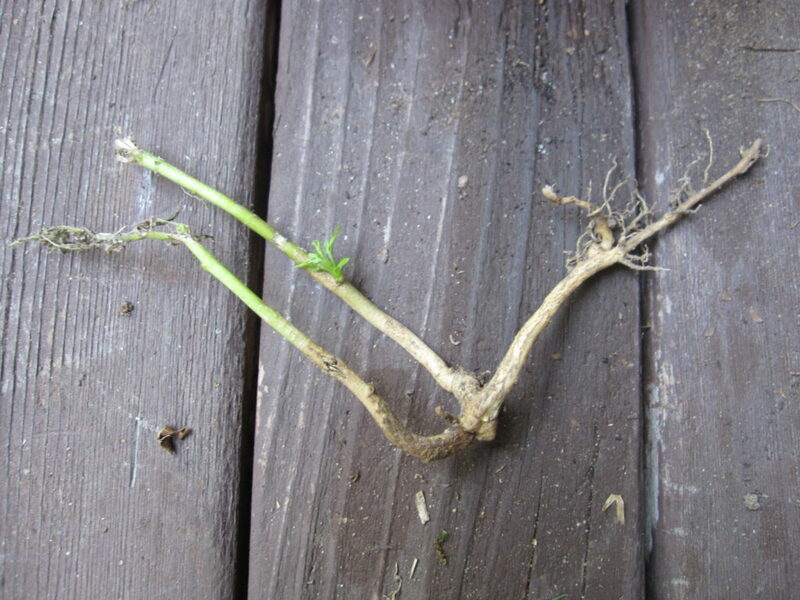 Suckers are connected to pre-existing rhizomes or lateral roots that require special attention, since when pulled they will regrow in clusters. However, Ailanthus web worm is a native biological control that often eradicates these small shoots. 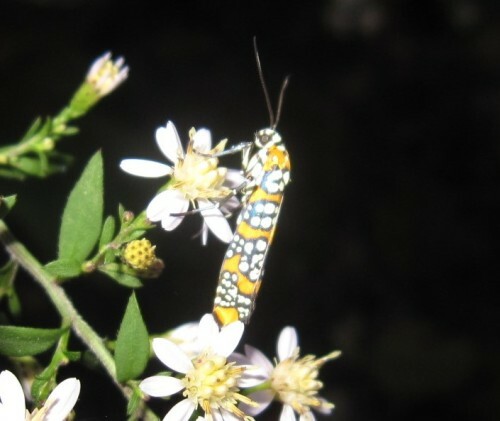 The Ailanthus webworm arrives on Long Island from Florida in July/August and its larvae can be found eating on some of the leaves. Pull out dying seedlings along with their larvae and place them against living shoots. The caterpillars should move to the new plants and renew feeding. Monitor the progress of the larvae as they morph into pupae. The pupae will not survive Long Island’s winters but, who knows, they may evolve to overwinter someday. Simply cutting down this tree species stimulates the roots to produce numerous clones along their living and fast growing rhizomes. 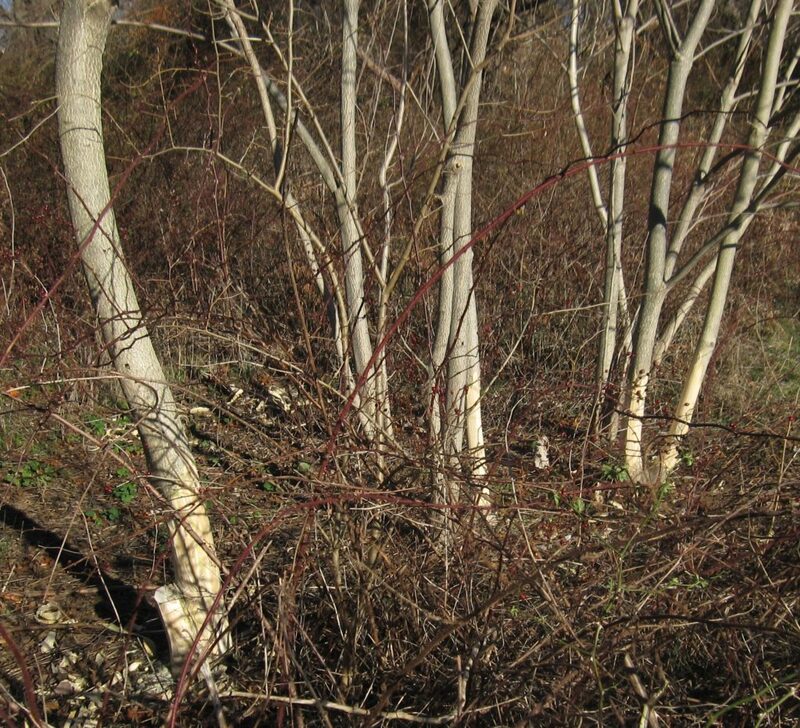 Since the tree aggressively sprouts when cut, the stem or trunk should be debarked to kill it and its roots a year or more prior to taking down, depending on tree size. Be aware: Some municipalities require permits to cut or debark trees. 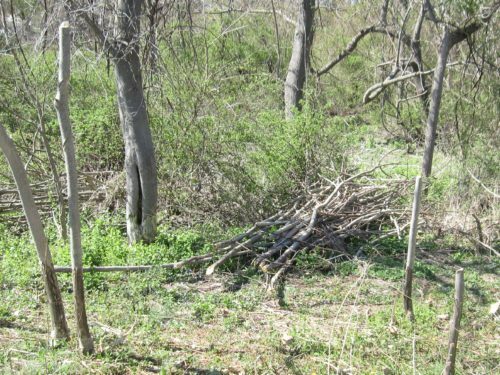 Debarking: Saplings and trees may be killed down to the root in the winter* months by a very reliable method that debarks the stem or trunk, using a 5 inch draw knife. This method assures that the roots eventually die along with the trees to limit viable shoots from emerging — although large stands may produce a number of shoots. Wearing gloves (the sap is known to be toxic), and with the back of one’s underarm wrapped around the tree, lean down, and starting from the ground with the draw knife, shave upward to between 18 and 24 inches, removing only the rough, fibrous outer and inner bark to the very smooth, slippery inner surface. Use a wood chisel and hammer to remove any missed bark right to the ground. Often the bark will rip or peal down to the root. Pealing reveals the sweet spot (white and viscous) between the bark and the inner hardwood. Removing the two outer layers of bark in the winter without touching the inner wood where the xylem channels persist disrupts the phloem, thus depriving the roots of nourishment from the top down. Because sprouts (or rather suckers) will grow in any space that is not properly debarked, there can be no gap. Sprouts that may occur generally snap off the tree or pull easily from beneath the ground as the tree and root dies. We allowed the dying trees and stumps to desiccate until they fall with a good push. Every time sprouts are removed the root reserves weaken. 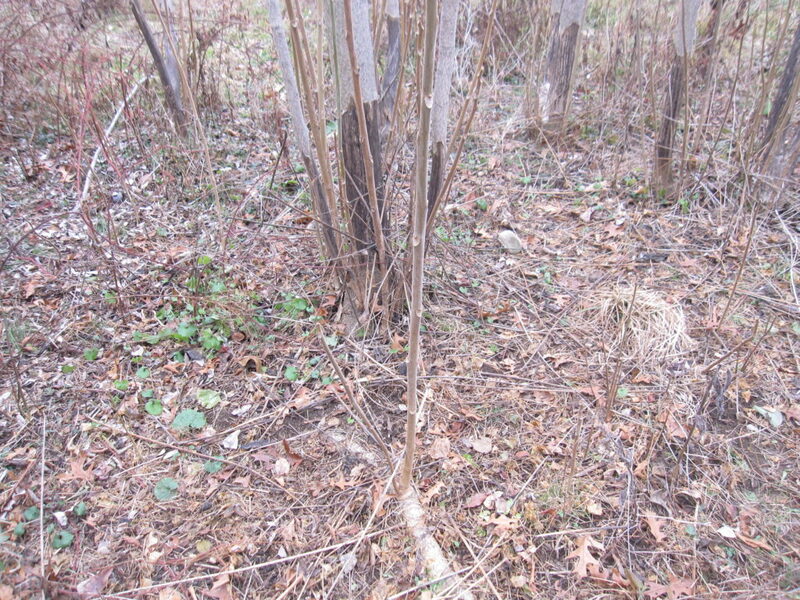 A year or more later, small saplings, shoots, and desiccated roots should easily pull out or be snapped off. Use a weed wrench on larger plants, preferably during the spring/early summer. Naturally, extra care must always be taken when climbing a dead tree to cut it down. If any sprouts are firmly attached in the ground they are likely to be viable. Plan on debarking them next winter, or leave them in place if they are hosting Ailanthus webworms. Our Experience: We easily debarked one hundred trees at Carpenter Farm Park in December* 2015, removed sprouts during the summer of 2016, snapped off and uprooted the dead trees and more sprouts in April 2017 and again in August 2017. Larger trees may need more time to die. One thing we failed to account for was the newly opened canopy, which allowed the ample seed bank to sprout a dense number of both native and invasive plants. 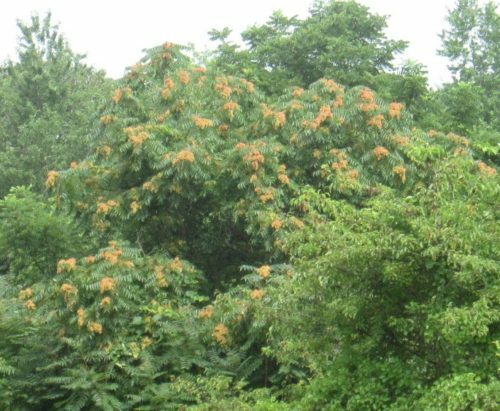 The high rate of invasives’ growth and of Ailanthus regrowth could also be an anomaly due to the unusual hot and wet weather we had in May 2017. While sprouts are typically easy to remove, my volunteers and I worked hard to dig out large invasive shrubs that blocked our access to many of the Ailanthus trees, slowing the removal process. * Note: Our timing to debark in December appears to be the reason for the large volume of shoots that grew. 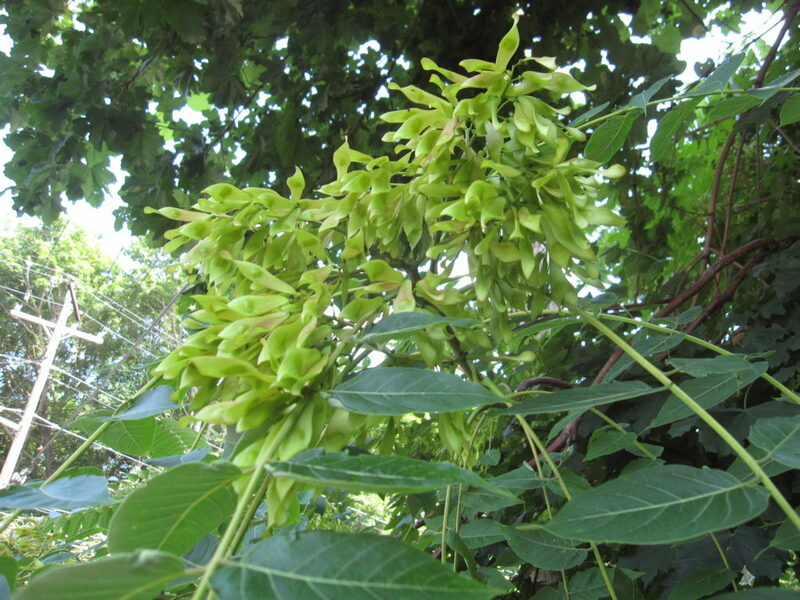 According to the U.S. Forest Service, Tree-of-Heaven is most vulnerable early in the growing season just after rapid tissue growth has depleted carbohydrate reserves. Also, the bark is “loose” in spring and early summer when the cambium is active, making the bark easier to peel.